The Mercedes-AMG GT is a racing icon that is second to none. The Mercedes-AMG GT combines the fascination of an authentic sports car with segment-specific technology leadership and high practicality. With a top speed of 304 km/h and an acceleration from 0 to 100 km/h in 4.0 seconds, the Mercedes-AMG GT fits optimally into a sporty lifestyle. He expresses the essence of the performance brand AMG. Sample options/combinations displayed. Please contact your local Mercedes-Benz dealership for a full list of available options. Just a few more clicks towards your Mercedes-AMG configuration. Select your country and we will get you to the configurator. Athletic front. Muscular rear. Dynamic silhouette. Out in front: the front design of the Mercedes-AMG GT. Numerous elements from racing form a dynamic statement. The long, wide bonnet sets the direction. The AMG-specific radiator grille emphasizes the sporty character. The new design of the LED high-performance headlights and especially the new daytime running lights design make the front of the Mercedes-AMG GT even more striking than before the facelift. The classic fastback design features LED rear lights with darkened elements inside. The redesigned rear diffuser with two round double tailpipe trims in high-gloss chrome underlines the dynamics. The dynamic silhouette signals an unstoppable forward thrust. The striking new side skirts design with stronger contouring and additional decorative elements opens to powerful shoulders. These headlamps are a highlight in two respects: thanks to all-LED technology they enable you to see and be seen better – and therefore offer enhanced safety. With their striking design the front lights and tail lights are already bright during the day, while at night their technical excellence shines through in particular. The AMG exhaust supports the sporty character and at the same time the suitability for everyday use of your vehicle. It impresses with a powerful V8 sound under strong acceleration, but remains subtly in the background when driving at a steady speed. The 2 chrome-plated round twin tailpipe trim elements are a clear indication of your vehicle's power reserves. A special acoustic experience is provided by the switchable AMG Performance exhaust system. Two variably adjustable exhaust flaps allow you to change the sound of the vehicle at the push of a button. Depending on the driving program, the sound characteristics change from unobtrusive comfort to maximum emotionality. 48.3 cm (19 ") / 50.8 cm (20") AMG light-alloy wheels in Y-spoke design, black matt finish and high-sheen finish with VA 265/35 R19 on 9 J x 19 ET61, HA 295/30 R20 on 11 J x 20 ET68. Benefit from excellent deceleration in any situation: the AMG high-performance composite brake system is your reliable partner when it comes to reducing speed. The internally ventilated and generously sized brake discs featuring composite technology are fade-resistant and enable outstanding deceleration values. Reliability in extreme situations, even after full brake application several times in succession: the AMG ceramic high-performance composite brake system delivers deceleration performance that you can count on even in exceptional situations. It is also lighter than conventional brake systems – less unsprung masses for enhanced driving dynamics and agility. Building on the extensive standard equipment, the Mercedes-AMG GT Coupé offers numerous options for customizing the exterior. High-performance material meets high-performance car: the carbon-fiber elements for the exterior underline the sporty character of your Mercedes-AMG GT, and lend your vehicle an even more sporty and technologically advanced look. The benefits of the material from the world of motorsport, namely high strength combined with low weight, are a perfect match for the AMG philosophy. With the exterior chrome package you can give your vehicle a particularly elegant and elegant appearance. The shiny chrome elements for the exterior emphasize the high quality of your Mercedes-AMG and upgrade it from every perspective. The AMG Exterior Night package features selected exterior elements in black with a high-gloss finish. This results - depending on the desired paint color - in either strong contrasts or flowing transitions. Whether exciting accents or sovereign restraint: In both cases, you demonstrate a sense of individual, dynamic design. The optional AMG Performance seats of the Mercedes-AMG GT with maximum sportiness in the seating position lay the foundation for maximum sovereignty in handling. The strongly contoured seat with integrated headrests and AMG badge combines ideal lateral support with a sporty driving style with a particularly dynamic appearance. AMG Performance Steering Wheel in Nappa Leather. This AMG steering wheel is lined with fine nappa leather and perforated in the grip area. The flattened shape typical of AMG has been adopted from motorsport, and underlines the sportiness of the cockpit. Ergonomically positioned touch-control buttons ensure intuitive ease of use and are conducive to focused driving. Center Console with AMG Drive Unit. The center console of the Mercedes-AMG GT makes the interior of the sports car something very special. The stylized V8 arrangement of the AMG Drive Unit has been further developed with the facelift and supplemented with innovative display switches for selecting various settings. With the optional touchpad you control the display of the multimedia system as you can with a smartphone. Intuitive wiping movements facilitate navigation in the menus. A haptic feedback accompanies every input. The touchpad recognizes your handwriting in case you want to enter addresses or telephone numbers silently. With the facelift, the control and display concept of the Mercedes-AMG GT Coupé is expanded to include a number of innovative elements. Touch-control buttons on the steering wheel and high-resolution displays set the standard in the segment. The digital displays and animations on the instrument and media display make vehicle functions easier to experience. Familiar strengths such as the intuitively understandable operating philosophy and the high legibility of all displays have been further enhanced. The AMG seats support you and your front passenger securely even when adopting a sporty driving style. The distinctively shaped seat side bolsters optimize lateral support and, together with the integral head restraints, the transverse piping design and AMG badges in the seat backrests, reflect your high performance standards. With maximum sportiness in terms their seating position, the AMG Performance seats lay the foundations for optimum handling poise and assurance. The strongly contoured seat shape with integral head restraints and AMG badge combines ideal lateral support when adopting a sporty driving style with a particularly dynamic appearance. Shown on the powertrain of the Mercedes-AMG GT R.
An aggregate of racing-level performance - the V8 twin-turbo with twin turbochargers inside is designed for maximum performance and dynamic engine mounts adapt to any driving situation. In addition, the dry sump lubrication deepens the low installation position even further. Thrilling: explosive responsiveness with high torque. The front mid-engine forms a solid unit with the dual-clutch transmission. The components are rigidly connected to each other via a torque tube so that they are resistant to bending. Inside rotates an extremely lightweight and torsion-resistant carbon-fiber driveshaft. It consistently transfers the power of the 4.0-liter V8 biturbo engine to the AMG SPEEDSHIFT DCT 7G. It ultimately translates the force into acceleration. Incredibly fast and breathtaking. From comfortable cruising to sporty driving: the suspension adapts to your wishes at the touch of a button. With "Comfort" you get a balanced damping characteristics, "Sport" and "Sport +" support you with a tighter coordination of a more sporty driving capacity - the choice is yours! The AMG SPEEDSHIFT DCT 7G impresses with rapid shift times, emotional declutching and performance on racing level: the sportier the mode, the more agile the response. Small differences in engine speed allow optimal translation adjustment and fast gear changes without any interruption. Seven gears, three driving modes and a manual mode as well as double-declutching and RACE START functions enable extremely dynamic acceleration maneuvers. © 2019 Mercedes-AMG GmbH. All rights reserved. The figures are provided in accordance with the German regulation 'PKW-EnVKV' and apply to the German market only. Further information on official fuel consumption figures and the official specific CO₂ emissions of new passenger cars can be found in the EU guide 'Information on the fuel consumption, CO₂ emissions and energy consumption of new cars', which is available free of charge at all sales dealerships, from DAT Deutsche Automobil Treuhand GmbH and at www.dat.de. Do you own a Mercedes-AMG? Become part of the AMG community! Join the AMG Private Lounge – the exclusive community for Mercedes-AMG owners. Take your place in the AMG Private Lounge! 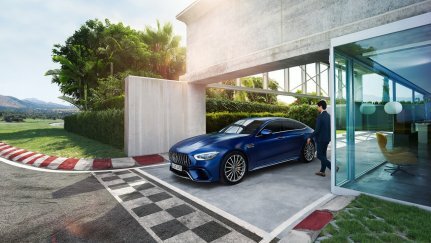 Here you’ll access unique AMG insider news, connect with other Mercedes-AMG owners and attend exclusive AMG events. Experience the AMG Private Lounge today.